In the Spartak stadium, in front of more than 40 thousand people and millions of spectators around the world, the 11 winning children of the “From the Hand to the World” program developed by McDonald’s, came out on the court escorting the players of the national team in their debut in this World Cup Russia 2018. A voice in the Spartak stadium announced the names one by one of the Argentine children who would accompany the Argentine players on their way to the court and the giant screen projected their names. 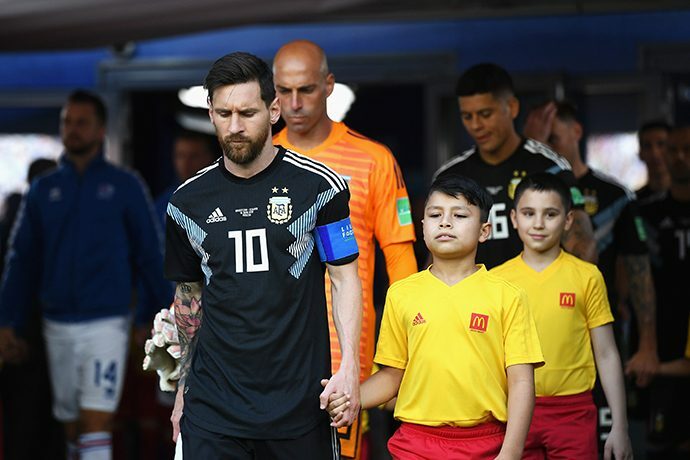 But the culminating moment was when Felipe, Tomás, Milagros, Morena, Lihuel, Adriel, Valentino, Kevin, Felipe, Kirill and Thiago walked hand in hand with their idols with the anthem of FIFA in the background and stopped in front of the national team to sing the Argentine national anthem. For many of the children who came to Russia with McDonald’s and who live in different cities across the country, this was the first time they traveled abroad, and even for some as Kirill involved the return to their homeland almost 4 years later. The heroes of their families, who were chosen by an honorable jury for the values ​​that make their family proud and that represent all Argentines, traveled with their parents who accompanied them at all times and lived with tears in their eyes the departure of their children to the field from the hand of the players of Argentina. The 11 children and their families, who a couple of months ago received the news of having been chosen as the winners of the McDonald’s program “From the Hand to the World Cup”, lived unique moments in this adventure with a world spirit: they met Javier Mascherano ( the ambassador of the contest), were received by President Mauricio Macri and their stories became known throughout the country. We carry out this program because McDonald’s is recognized as the family’s favorite restaurant and we want that, beyond living an experience in our restaurants, families can live unique moments like these in the hands of the brand. This program represents an opportunity as a mark to be able to recognize in these 11 children key values ​​such as companionship, humility, solidarity and honesty and, at the same time, to be able to fulfill their dream in a World Cup and have an indelible memory, said Gabriel Serber Director General of Arcos Dorados Argentina. During this World Cup 2018 in Russia, around 1500 children from all over the world will be able to live this unique experience of going out to the field in all the matches of this World Cup. McDonad’s has been carrying out this program since the 2002 World Cup, and already allowed more than 10,000 children to be part of this dream.